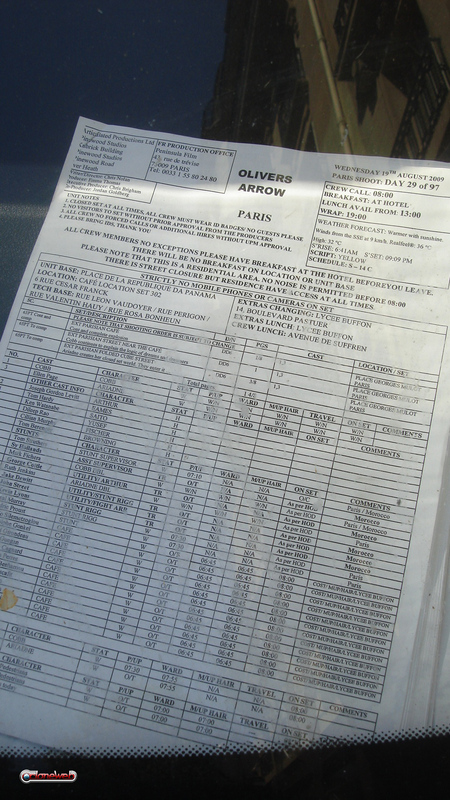 The production has been shooting in Paris all week (see a set photo above thanks to ComingSoon), and a site called CloneWeb (found via NolanFans) has apparently gotten their hands on the call sheet. What does the call sheet tell us? Well… not much. But we do finally learn some of the names of the characters in the film. Ellen Page is Ariadne, Joseph Gordon Levitt is Arthur, Tom Hardy is Eames, Ken Watanabe is Saito, Dileep Rao is Yusef, Cillian Murphy is Fischer, Tom Berenger is Browning. Leonardo DiCaprio’s name is missing from the list, but everyone assumes he might be named COBB, since this name appears above Page’s on the sheet, but without any actor listed. It is possible that CODD is just a code name for DiCaprio which may not even be used in the movie at all. Either that or COBB s a computer generated character. Want to know what the film might be about? Here is what we knew already: Leonardo DiCaprio plays the lead, a CEO-type, Marion Cotillard (La Vie en rose, Public Enemies) is his wife, Ellen Page (Juno) is a young college grad student and DiCaprio’s sidekick, Joseph Gordon-Levitt plays an associate working for DiCaprio. Ken Watanabe will play the film’s villain, a man who is blackmailing Leonardo DiCaprio’s character. Tom Hardy (Bronson) is a member of DiCaprio’s team. Cillian Murphy (Batman Begins, Sunshine) and Michael Caine are also signed on, but no details are known about their characters. Inception is scheduled to hit theaters on July 16th 2010.